As a kid growing up in Wisconsin, I remember carolers coming door to door. My mom would always have a plate of cookies around to hand out after they sang a carol or two on our front steps. These days the practice isn't very common. In fact, I've never had carolers knock on my door in California, which is too bad, because nothing gets you in the Christmas spirit like a rousing rendition of "Joy to the World" or "Hark! The Herald Angels Sing," and there's nothing like a tender version of "Silent Night" or "The Little Drummer Boy" to remind you of the real meaning behind the holiday. VICTORIAN MOTIF! The Uncommonne Carolers, (left to right) Craig Updegrove, Karla Santare, Meagan Glimpse, and Chuck Hiigel, perform everything from church hymns to modern popular holiday songs arranged both simply and in more complicated jazz and classical styles. Similar to me, Linda A. Wilson—the musical director of the Victorian-style Uncommonne Carolers and a member of the '50s-style trio The Jingle Belles—grew up on Christmas carols and church singing. When she moved to the Central Coast and started singing in groups such as the SLO Master Chorale, it made perfect sense to gather some of her follow performers to do some casual caroling as the holidays rolled around. 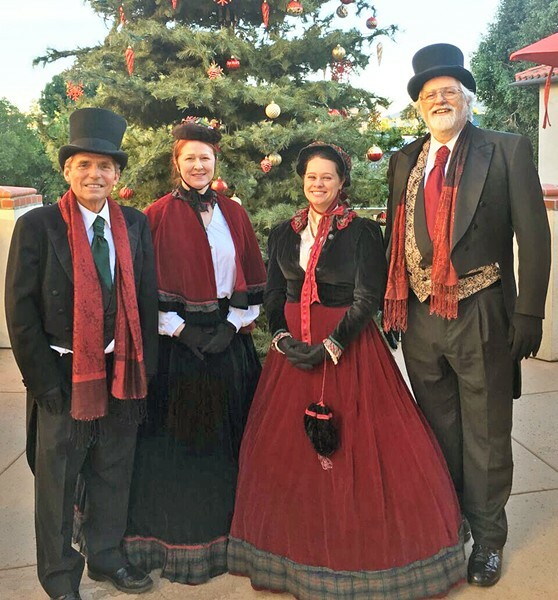 Now nearly 30 years later, her casual caroling group is the professional Uncommonne Carolers, which has had as many as 16 members working in four quartets, performing all around SLO County and as far south as Solvang. To expand her repertoire and invigorate her interest in caroling, a few years ago she formed The Jingle Belles with Terri Kahn and Donna Jones, who sing in the tight vocal harmony style of The Andrews Sisters. Wilson's groups are hired by private parties as well as big companies: "We've been singing at the Downtown Centre, Court Street, and now the Monterey Street developments for a very long time, as well as Eberle Winery. In recent years, we've been singing at the Friends of Oceano Airport Toys for Tots Fly-in, at Rita's Rainbows Craft Holiday Faire, and the Shell Beach Stroll. Last year, and again this season, we'll be appearing several times at Cambria Christmas Market," Wilson said. Both the Belles and Uncommonne singers are top-notch performers: "A cappella singing in a small group requires excellent vocal skills and the ability to blend and sing solos when needed," Wilson noted. "Singers learn very close harmonies and stay both in tune and on pitch. In addition, singers need to be 'performers' and be able to relate to audiences, large or small." Both groups' Facebook pages offer ways to reach Wilson for bookings, or people can email her directly at lindawilsonslo@gmail.com. Just so you know, The Jingle Belles already have a very full holiday schedule! As early as August, both groups begin to gather to work on their repertoire, some of which holds over from previous years and some of which is added with each new season. "Songs are selected based on having a well-rounded song list to meet the needs of different situations," Wilson explained. "Our 'book' is updated every year. I write new arrangements of existing songs and new songs are added. We definitely take requests in advance and do our best to meet that request. We've also re-written song lyrics for specific events. In fact, we did a special event for a golf Christmas party and included 'Away In A Sand Trap,' among others. There are times that someone may request a song that we don't have in our book, and while we may not be able to perform it on the spot, if it's a good suggestion, it may be added the next year. That's how 'Suzy Snowflake' was added to The Jingle Belles' song list." FIFTIES SASS! 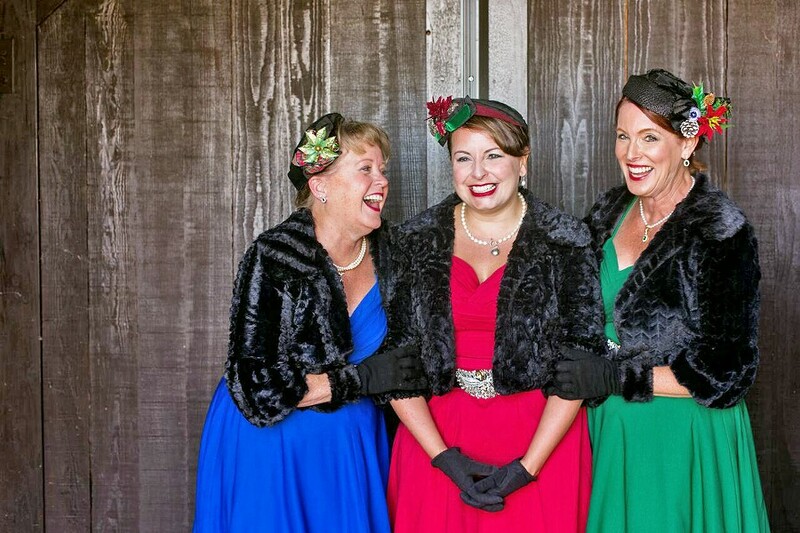 The Jingle Belles—(left to right) Linda A. Wilson, Terri Kahn, and Donna Jones—perform in the spirit of The Andrews Sisters, with original arrangements and tight harmonies. While the groups obviously get paid, there are other benefits to caroling. "Our favorite responses are from children," Wilson enthused. "They love the costumes and the bells we use. One person in each group is the 'bell ringer,' which we use to keep rhythm. When our kids were little, I made a costume for the daughter of the woman who sang alto in the group. It was a Christmas present so she could come and 'sing' with us the next year. That was probably one of my favorite years. She loved her mom's costume and wanted one of her own. She's grown up to be an amazing performer in her own right and is incredibly talented.